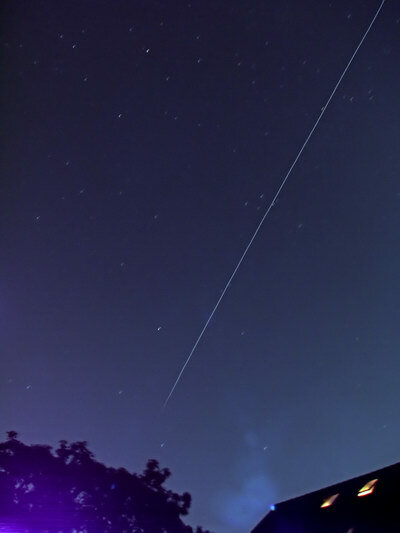 This is another ISS pass over Mülheim, from August 16th in a 128-second exposure. I’d like to wish Fraser Cain, the publisher of Universe Today, a happy birthday with this image! It’s a much better shot than my previous effort – only, for some reason, now the ISS trail is straight, but the star trails are a bit crooked. There’s also a bit of light pollution on the bottom from the balcony lamps and some sensor glow, but I like this better because the space station faded out before it went behind the maple tree.